Well, it’s spring and the temperatures are finally inching upwards and a young man’s thoughts turn to … cycling! Actually, my thoughts have been lingering on cycling quite a bit, thanks to the internet and postings from friends who live in warmer climates. I am just a little bit jealous of those who ride all winter. Actually, we have had a relatively mild winter and I kicked myself for having put away my bikes so early several times. But I’ve brought one of my bikes, the Tour Easy 2-wheeled recumbent out to the garage and am getting it ready to ride while I plot my plan of attack for the Expedition trike next. Last year sometim e, I spotted a neat product on Kickstarter. It was called the RapidoPro pump head for bicycle tire pumps. The name later changed to TaggioPro. 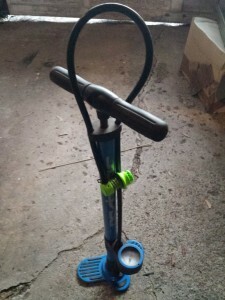 It promised a better way of attaching a tire pump to your bike tires. Like building a better mousetrap, many have tried and many have failed. You see, the problem with bicycle tires is they come with two different valve stems, Presta – thinner with a nut you tighten to lock closed, and Schrader – thicker and just like the ones on you car. Many pumps fit one, but not the other. Some require dissasembly an reassembly with parts turned around. A few work for both, but don’t always do it well. I have always preferred the Presta style valves on bicycles. Even if they come with Schrader valves, I generally convert them over. 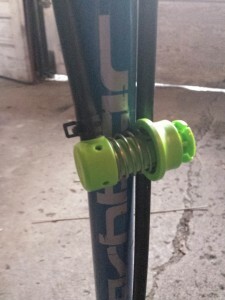 Doing so is simple, just buy a new tube with a Presta valve and install it on the wheel with a small adapter to fill the larger hole in the rim. In a pinch, the adapter can be left out, but it’s a good idea to have them and use one. They are cheap, but a little hard to find. The good thing about having converted from Schrader to Presta is, with the larger hole already in the rim, if you need a new tube and you’re caught out on the road, the Schrader valve is easier to find in a store. You can buy bicycle tubes in WalMart or Western Auto (Do they still exist?) but the selection is limited, especially in odd sizes like a recumbent might use. So, even though the pump I have did fit either size valve, the RapidoPro, as it was called initially, looked like a better product. I had had some trouble with the dual-size head I had failing to seal at times, so an improved product would be welcome. And the cost was reasonable. But, like many Kickstarter projects, you need to be patient. The project owner was good about keeping everyone updated with regular emails and updates on the web, but the riding season was over before I got mine. So it sat here until now waiting to be tried out. So, today I finally got around to installing it and trying it out. Installation was easy, the old pump head simply unscrewed and can be put back on if I want. No cutting of the tubing was needed. 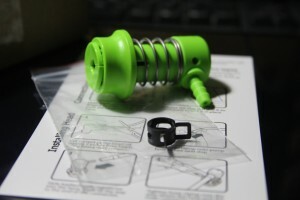 The new head’s barbed fitting slid right into the tubing snugly and the spring clamp was easy to secure it with. To use, the ring on the head can be pulled back and rotated to set the size/type of valve. P for Presta, S for Schrader. No confusion there. The photo shows it set for Presta and to use it, you just press the head over the valve then push the ring down to lock it. Removing it when done is simple, just place your fingers on either side of the ring and press the back with your thumb, just like you were using a syringe. I only topped off one tire to try it out and I haven’t used it on a Schrader valve tire yet, but I don’t anticipate any trouble. It seems sturdily made and should last a long time. I’ve bought expensive brass Silca track pump heads in the past that didn’t work this well and once the O-rings wore out, were useless. For under $30, this is a great product. Now, if only the heads on my frame pumps worked this well! One thing that impressed me was the attention to detail and effort spent to keep the backers updated through the pre-shipping times. They sent regular updates to backers via email and posted many videos on their web page showing the testing and problem-solving they were going through before they put their blessing on a final product. Read the website, it’s pretty interesting.